I love Christmas but equally I absolutely love the sales as I love buying something and knowing i've saved a bit of money. I've taken my time posting this as I actually bought all of this on Boxing Day so please forgive me! I love the Boots sale and usually resist the temptation to buy much until the sale as I know it will be half price after Christmas. I look for the Christmas Gift Sets that contain full sized hair products as they usually work out a lot cheaper than buying them individually. Giles Deacon for Toni & Guy Weekend Bag. I'm not a huge fan of the bag but I bought this for all the products inside. It was £20 in the sale and I absolutely love their hairspray and shampoo so it was well worth the money. The products inside are worth around £35 if you buy them individually (not including the brush, bag, mirror or sectioning clips) so I definitely saved myself some pennies! 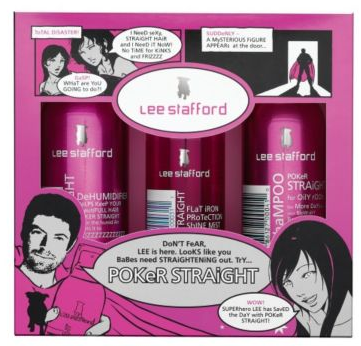 Lee Stafford Poker Straight Gift Box. I've mentioned plenty of times before about my love for Lee Stafford's range so I picked this up as I love the dry shampoo. It was £7.50 in the sale which is again a big saving as the products are worth around £15 individually. Guinea Pig Hot Water Bottle. This was £6 in the sale. I love Guinea Pigs and for Christmas last year I got the very comfy jumper featuring the same design. I saw this when it wasn't in the sale but I thought i'd wait until it was a bit cheaper as £12 is a bit pricey for a Hot Water Bottle. I've never had one before so i'm looking forward to using it since we've had such cold weather recently. Huge apologies for the photos from the Boots & Topshop website. I couldn't get any decent lighting and the Toni & Guy set is a bit too big to photograph! I had a quick look in Boots yesterday and all the Christmas gifts are now half price, unfortunately I don't have any money which is lucky really otherwise I really would have splashed out! I was tempted by the Toni & Guy set, almost every year I get a hair set in the sale from Boots, but so far I haven't. I never can resist a Boots sale though, I got a Fearne set and a Joules set in the sale, but I havent't been back since to see whats left! I really wanted a Ted Baker set too, but when I got it to the till, the storage box it came in was all damaged so I didn't bother. gosh boots sales are my absolute weakness. That Toni & Guy bag is gorgeous, and I NEED that Guinea Pig hot water bottle, adorable! Ooh you got some great bargains. The Toni & Guy set is great, love the bag it comes in. I love the Boots sale too, though I was a little late going to it and there wasn't much there. The hot water bottle is so cute!! !